In a few short weeks, Star Trek Into Darkness will open in theaters in the United States. Its release will culminate four years of news, rumors, and speculation after audiences were dazzled after watching J.J. Abrams’ Star Trek reboot movie in 2009. According to early international reviews, the sequel film will be well worth the wait. 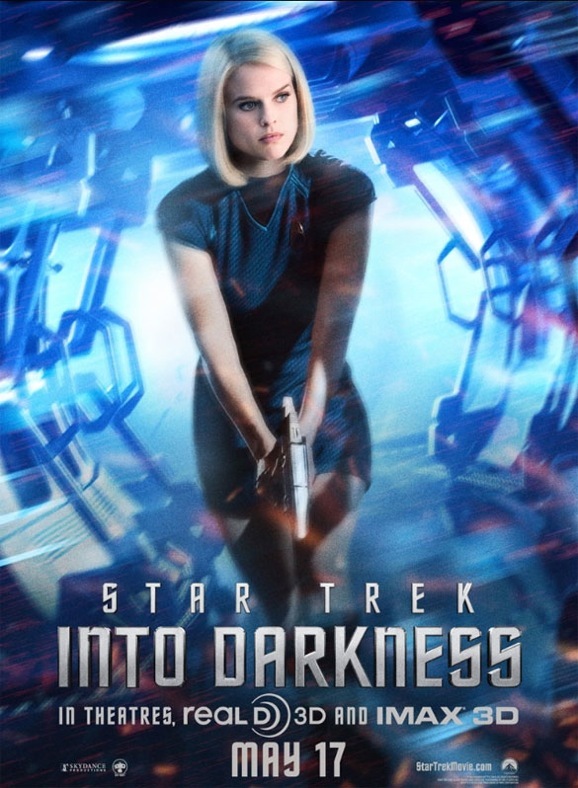 Practically everyone on Star Trek Into Darkenss call sheet got their very own character poster, so now Paramount delivered yet another one for franchise newcomer—at least as far as J.J. Abrams’ reboot is concerned—Carol Marcus, played by Alice Eve. I’m actually a little bit impressed that the photo they chose for this poster isn’t that shot of Eve in her underwear. Seriously, the marketing team likes cramming that footage into every spot they can, whether it makes sense or not. The summer movie-going season kicks into gear next Friday with the release of Iron Man 3, and Star Trek Into Darkness will follow only two weeks later, on May 17th. Paramount Pictures has released a new behind-the-scenes featurette that centers on Captain James T. Kirk (Chris Pine), and why Star Trek Into Darkness is really his story. In 2009, the first Star Trek reboot film saw Kirk just discovering what made him special and becoming captain of the U.S.S. Enterprise. In Star Trek Into Darkness, we will get to see Kirk truly earn that title, and his starship. After an appalling act of terror from within Starfleet, the crew of the U.S.S. Enterprise is called back home to Earth. Despite strict orders, Kirk takes the attack personally and leads his crew on a manhunt to capture a one-man weapon of mass destruction before he can strike again. Lindelof was gracious about the teasing, and genuinely seemed appreciative. Of course, that didn’t stop him from laying a burn on Shatner in the middle of all the heartfelt gooshy stuff. I’m betting some of our GFR readers are currently sitting in movie theaters watching/getting ready to watch the “Best of Both Worlds” Star Trek: The Next Generation theatrical event that’s going down tonight. Hopefully it’ll be a great experience to see two of the show’s best episodes up on the big screen, but for those of us stuck here at home, we can at least check out the new trailer for the remastered TNG fourth season Blu-ray release up above. The set is “coming soon,” but doesn’t have a specific release date yet.